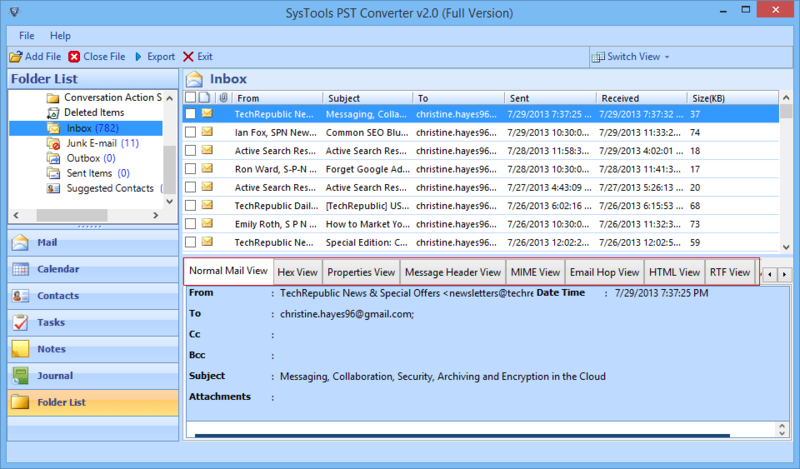 Outlook PST to NSF Converter allows user to convert Outlook PST file into Louts NSF file. Software convert all items of PST file such as emails, tasks, contacts, journal into NSF file. Filter Email & Tasks by Date: User can filter emails according to the time interval, you have to just select "From" and TO option filter emails of particular dates. The user can also check "Exclude deleted items" to doesn't retrieve deleted emails of between dates. Tool provides an option to select specific option of PST files, User can select different option such as Emails, Notes, Contact, Journals, Calendars to convert to NSF file format. After Conversion of PST to NSF File process, Software maintain the same hierarchy of folder and files. Software doesn't change the order of files or rearrange folder structure, so that user can easily the desired file. 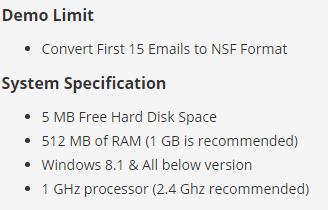 During the Conversion process, Software provides an option in Email Filter called "Exclude Deleted Items" used to exclude deleted items to reduce the size of converter NSF file. With the help of software, user can create a New Folder to save NSF File in the local system, rather than selecting location during the conversion process. PST To NSF Converter external application is a genuine tool to convert PST file of Outlook and save them in NSF format as per need. The underlying technology used to develop the utility stands atop amongst several other similar PST To NSF converter software applications. It is such a high-tech tool that it hardly renders any difficulty in the process to convert Outlook mailbox files proficiently. It is one of the best-suited tools to convert the file in NSF format. While the output NSF File of the dedicated utility can store all types of content available in the Outlook OST file, the output file can save the most important items that are emails. Hence, when the necessity is to convert PST to NSF the tool is seen as one of the most suited complete in all aspects. Click on the Export option to start the process of conversion. Now Browse the location of PST File in the local system. Select the specific PST file. Select different items such as Mails, Contacts, Calenders, Tasks, and Journals to export in NSF Format. Apply Different Filter for Emails, Calendars, and Task Filter on the basis of dates. Now Browse the Destination Path to store resulted data in NSF file. Click on "Export" option. 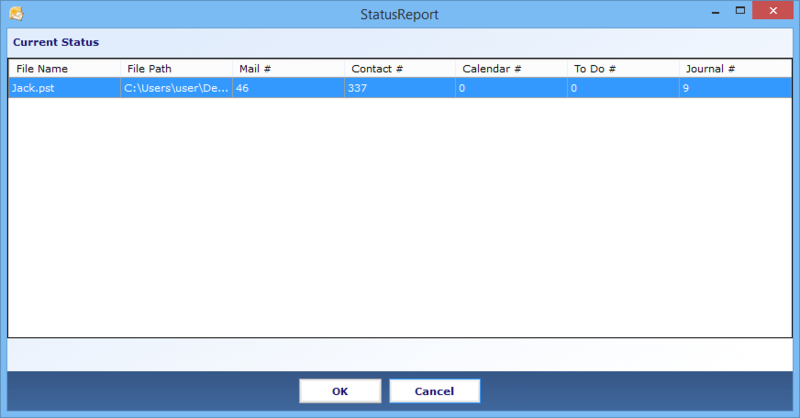 Outlook to Notes Converter display status Report after the Conversion process. Now Click on pop of Successful conversion and view the exported NSF File in the destination path. PST to NSF Converter Tool Replies All Doubts & Queries! Can I Convert my password protected file PST File into NSF file format? No, Software cannot cannot convert password protected PST file. You have to enter the correct password to open PST file, then you converts your files. 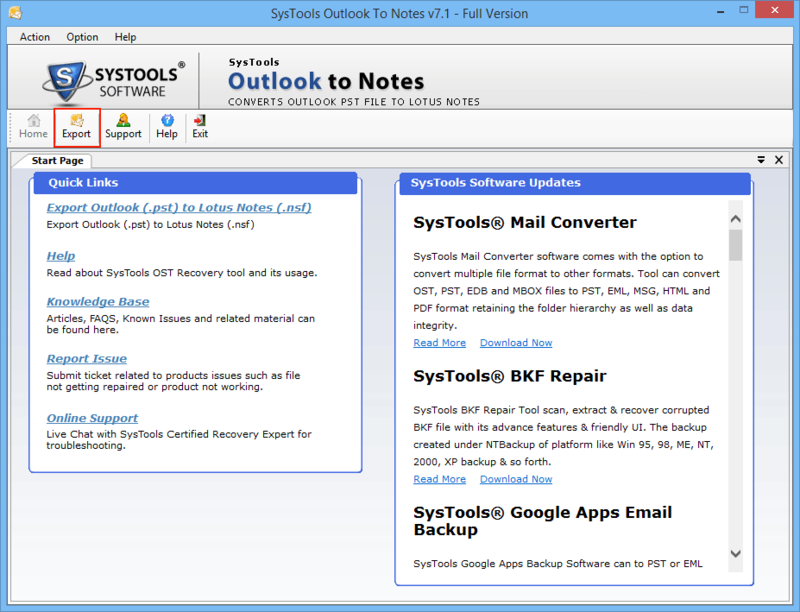 Is it neccessary to installed MS Outlook & Lotus Notes to run software smoothly? 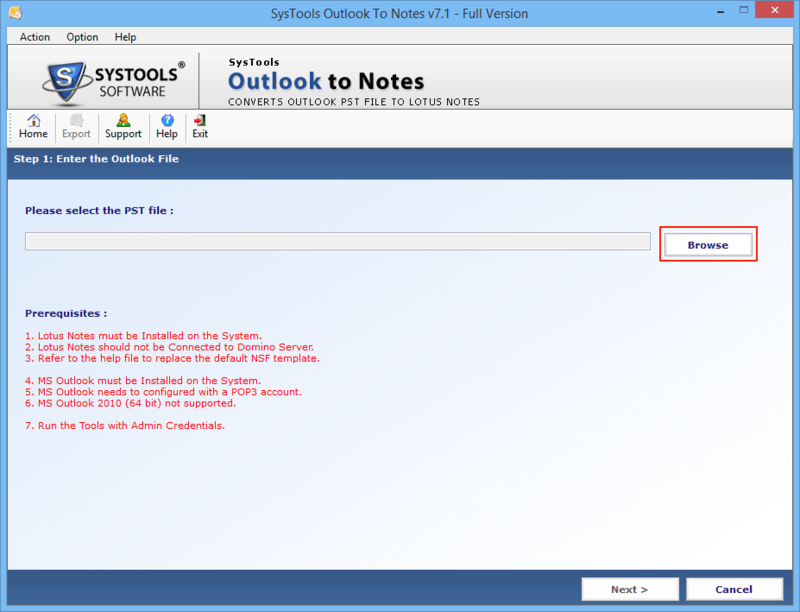 Yes, To run software smoothly, the Outlook installed properly, with the POP@/dummy profile. 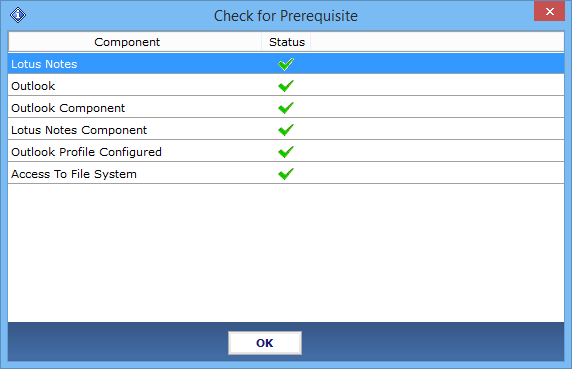 During conversion, it does not connnected to exchange server. I am getting the prerequisite error, how can I solve it? 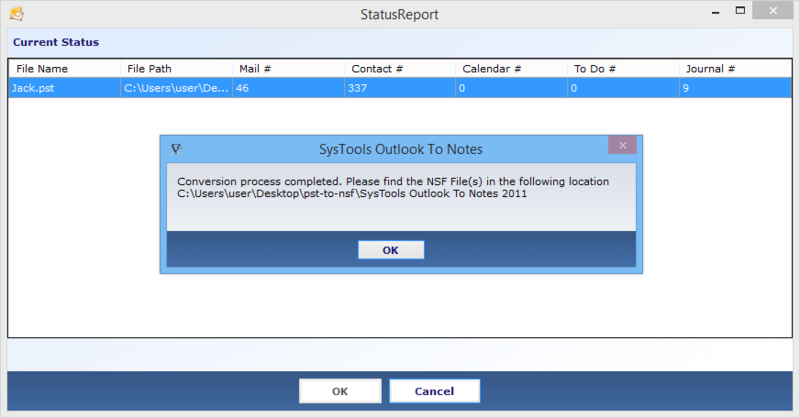 Software solves my problem of conversion of PST to NSF Format, As I shift to Lotus Notus Email Client from MS Outlook. Able to move my all files in arranged order with the help of Converter. Thanks to developer team! Great tool to convert all items of my PST files, especially large attachments of the file into NSF Format quickly. Filter options of PST to NSF converter provides me various option to export specific emails between dates, Even I can filter Task and Calendar files according to dates. 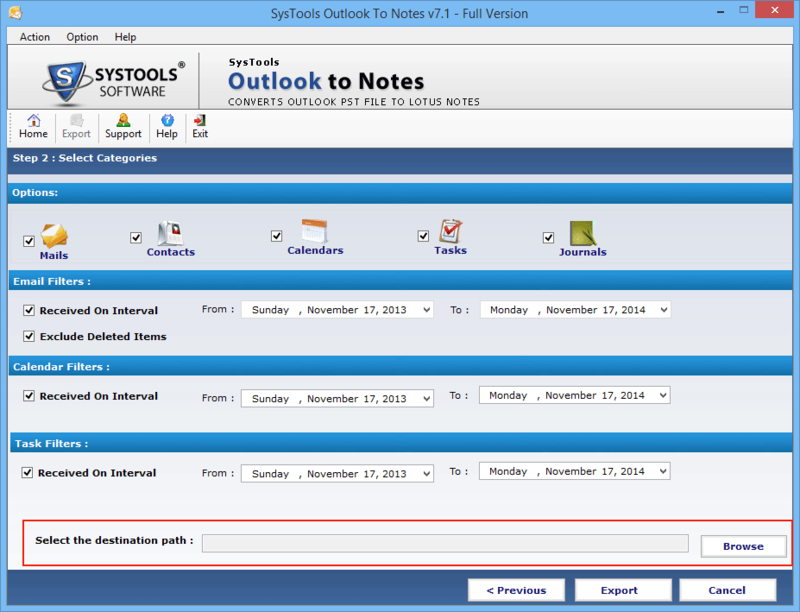 Simple and effective tool to import Outlook file into Lotus Notes file format. A naive user can convert Outlook data into Notes format without any help of a technical expert. Just load the file within the software and within few click, you are able to export desired files.